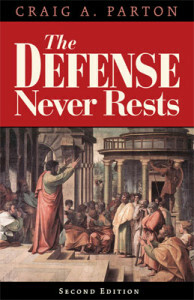 CPH recently released the second edition of Craig Parton’s The Defense Never Rests, a powerful critique of American Christianity that provides a defense of the pure Gospel. The new edition features sections dealing with the challenges of New Atheism, Bart Ehrman, and the new wave of biblical criticism. The following excerpt is from the book’s introduction. In the past twenty-five years, a number of prominent Evangelical churches have stopped displaying the cross in their sanctuaries. Bill Hybels, pastor of a leading American mega- (and crossless) church in Illinois, observed that unbelievers are offended by the cross. Some fast-growing churches have discovered that the world likes Jesus the Moralist and Jesus the Conservative Family Values Man. As for Jesus the atoning Lamb who died for the sins of the world, who suffered our deserved fate on that cursed tree, and who was indeed wounded for our transgressions—well, He just isn’t selling seats like He used to. The real Jesus apparently has a serious marketing problem. The late Dr. D. James Kennedy of the renowned Coral Ridge Presbyterian Church sent out a massive mailing of gold crosses with a corpus attached thereon. So? Only one problem—upon the cross hung the corpus of the American flag. Self-proclaimed Christian teachers chastise those who use non-seeker-friendly biblical terms such as damnation, wrath, hell, torture, rebellion, sin, blood, cross, death, grace, mercy, redemption, substitution, justification, and salvation. And such was I—in fact, chief among them. After many years as a zealous Evangelical and full-time missionary, I realized how little actual presentation of the pure Gospel I was engaging in and how little confidence I had in the power of God’s Word to crush human pride and to create saving faith. My confidence in my self-created “means of grace” was limitless—there were few groups I couldn’t persuade by adding a frothy chaser of biblical morality, the latest principles of communication, and the tried-and-true appeal to “felt needs.” The last thing on my mind after becoming a Christian in 1974 was ending up in the Lutheran (a.k.a. “dead”) church. Lutherans, in my view, needed conversion. They didn’t have the Gospel—they needed the Gospel. My journey out of generic American Evangelicalism is not especially remarkable. Witness the exodus of Frankie Schaeffer to Eastern Orthodoxy (along with scores of former Campus Crusade for Christ staff members several decades ago). Witness Thomas Howard, Scott Hahn, Frank Beckwith, and Peter Kreeft’s journeys to Roman Catholicism as well as Robert Webber’s move to Episcopalianism. Witness Michael Horton and the throng that has exited to Calvinism. No, an exodus from Evangelicalism is not remarkable. What is odd is that I landed where escapees do not generally go—to the orthodox Lutheran Reformation. At the pure stream of the Lutheran Reformation, I found the Gospel at the center once again—not just a polite mention of it in a sermon designed for non-Christians. I found a Christ willing to save even me, a sinful and failing Christian. For the first time, I found the Scripture taught with Christ in His saving office at the center of the sermon, with confidence that the authoritative Word was able to shatter hearts of stone and calm the terrified conscience of the guilty sinner. I found a church where we were instructed to get on our knees and confess our sins rather than shout, clap, and giggle. I found the artistic tradition of Albrecht Dürer and Lucas Cranach, the musical genius of J. S. Bach and Felix Mendelssohn, and a love for the natural world found in Johann Kepler and Tycho Brahe. The arts were affirmed as great gifts for use in worship because they placard Christ and the Gospel. I finally found reverence and a God I could again fear as well as love and trust. I found a link to the historic and universal (i.e., catholic) worship of the Church. I found a church where one didn’t simply ask if Mrs. Smith or Elder Jones liked the music, but whether it was a song that Abraham, Moses, and the apostles and prophets—better known as the communion of the saints—would gladly sing because of its solid doctrine and similarly substantial melodic line. I found an earthiness in Luther and the Lutheran Reformation that was refreshing—a freedom in the Christian life I did not think possible without becoming theologically liberal. But, most important, I found Christ crucified as the center and substance of Lutheran worship. I found a doctrine of the Christian life that flowed out of the forgiveness of sins and that let God do the saving and the sanctifying from start to finish. In short, I found the Gospel for me as a Christian. I found what it really meant to be evangelical. The journey was, and continues to be, difficult. More than ever, I believe that Lutheranism’s connection to the ancient Church can make it appear unfriendly to the modern-day Evangelical. Our journey to Lutheranism resulted in the loss of many friends and vibrant, large youth groups. My children saw their parents choose churches—and then leave churches—solely for reasons of doctrine. I fear for the countless Evangelicals who are ready to dump the church altogether rather than continue in a thinly veneered Sunday-morning version of the consumer-driven, info-byte, celebrity-centered secularism they live in all week. The “holy trinity” of newness (i.e., be cool), numbers (i.e., be big), and needs (i.e., be relevant) now provides the dominant “means of grace” within much of Evangelicalism. In Lutheranism I indeed found the evangel—the Good News—as the focus of its prayed, spoken, and sung confession. Yes, I found some things I thought were foreign additions—vestments, altars, candles, pipe organs, corporate confession of sin, kneeling benches, old hymns, written prayers, and a “liturgy” (whatever that was) conducted according to an equally unheard of “Church Year.” But I also found Christ at the center of all of it and as the reason for all of it. Lutheranism gets the cross right—why it was necessary, what it accomplished, how I am saved, and how that salvation is delivered to me as still a wretched sinner today. 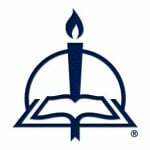 Lutheran theology, teaching, and worship anchor the life of the redeemed believer in Christ and His cross. Thus, this is not the story of leaving Evangelicalism. It is the story of realizing what was missing and then finding authentic evangelicalism in the evangel of Jesus Christ. From The Defense Never Rests, 2nd edition, pages 13–17 © 2015 Concordia Publishing House. All rights reserved. To order The Defense Never Rests, please contact CPH at 800-325-3040 or visit www.cph.org.